As part of your Werribee Zoo experience you get to take a safari bus through huge open savannah grasslands. 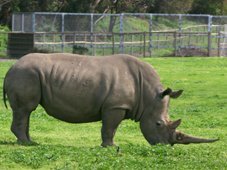 You get up close to Giraffes, White Rhinos, Bison, Zebra and more, grazing in natural surroundings. A 45-minute safari is part of your entry ticket. We found it a good idea to do this safari first, as it gives you a good sense of the zoo and what else there is to see. The bus takes you out into vast areas of savannah. There are American grasslands with Bison, Asian areas with Wild Horses, Antelopes and Camels, and large African plains with Giraffes, Zebras and White Rhinos, all roaming around freely. The bus stops frequently and you get really close to many of the animals. Back at the main area of Werribee Zoo, you can take a walk through an Australian section amongst Wallabies, Kangaroos, Emus, Brolgas and many other native birds. This is one of the best and most expansive Australian animal displays I have seen. The other large walking track leads you through Africa, with Lions, Meerkats, African Wild Dogs, Hippos and Cheetahs, and soon also Gorillas  all with authentic African huts and scenery. 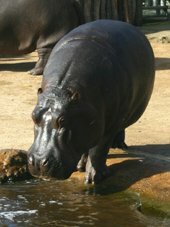 You get to feel part of the zoo, witnessing a Lion and the Hippos being fed and cared for. For an extra charge you can get some closer animal experiences. There is the African Cat encounter, a session with the Rhinos, and an open smaller vehicle safari that gives you a more intimate and longer time with the savannah animals. There are special Giraffe encounters and Lion feeds. You can also stay overnight and add to your safari an overnight experience in luxurious canvas safari tents with barbecue feasts and cooked breakfast. 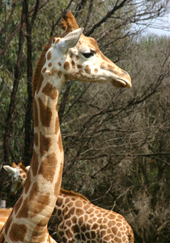 You can get into the Werribee Open Range Zoo much cheaper with the Melbourne Sightseeing and Attraction Pass. This is available for short stay tourists, and also for locals who can visit five Melbourne attractions at much reduced rates over a 3-month period. Werribee is only ½ hour drive along the Princes Freeway southwest of Melbourne. Take the Werribee South exit. You can also get there by public transport: by train to Werribee and from there by short bus ride.